The University of Toledo is updating a number of its automated external defibrillator stations to also include tourniquets for the campus community to be better prepared to respond to emergency situations. 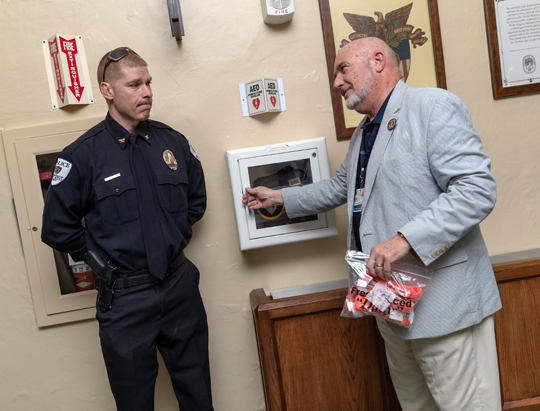 While AEDs — portable devices used to treat sudden cardiac arrest — have been available for several years across UT campuses, this is the first time commercial-grade tourniquets also will be available in several AED stations. Dr. Paul Rega, right, talked to UT Police Chief Jeff Newton as he placed tourniquets in the automated external defibrillator station outside Doermann Theatre. On May 10, signage was installed marking the AED/tourniquet station in University Hall and 19 other such stations located across UT campuses. “Thanks to the generosity of the UT Foundation, we were able to purchase 100 combat application tourniquets, as well as signage to help individuals locate these combined AED/tourniquet stations during an emergency,” said Dr. Paul Rega, assistant professor of public health and emergency medicine. As emergency preparedness has evolved in the U.S. during recent years, paramedics and other medical professionals have turned to using military-grade tourniquets to help save lives during disasters such as building explosions caused by gas leaks, vehicular accidents, crimes involving weapons, and other life-threatening emergencies. As a result, some large facilities such as airports, malls and schools have begun equipping their sites with such tourniquets so they are on hand for medical crises, Rega said. This entry was posted on Friday, May 18th, 2018 at 3:17 am and is filed under Advancement, Health and Human Services, UToday .